A detached rear-unit Mediterranean masterpiece with unparalleled design and the finest details offers the perfect blend of luxury and practicality. Ocean views, an abundance of natural light and dramatic high ceilings set the stage for the spacious living area with a fireplace. Both a formal dining room with open walls and a casual breakfast bar on the kitchen island offer seating for entertaining. Rich kitchen cabinetry, oversized refrigerator, double oven, Quartz counters, and a built-in desk makes this area a welcome hub in this home. Double door front entry, gorgeous wrought iron work, dramatic curved staircase, wide-plank dark wood floors, stone surfaces and recessed lighting hint at the quality of the workmanship throughout. To elevate the entertaining capability of this home is a bar area with a beverage refrigerator, wine rack and an outdoor patio with ocean views and a comfortable seating area. Above the patio is an additional seating area located on the rooftop deck. This space has unobstructed ocean views and captures the essence of SoCal living. The 4 bedrooms are seamlessly designed to feel bright and airy while the 4 spa inspired bathrooms are an oasis of luxury. The magnificent master suite feels cozy with the fireplace and the bathroom has a soaking tub, separate shower and dual sinks. 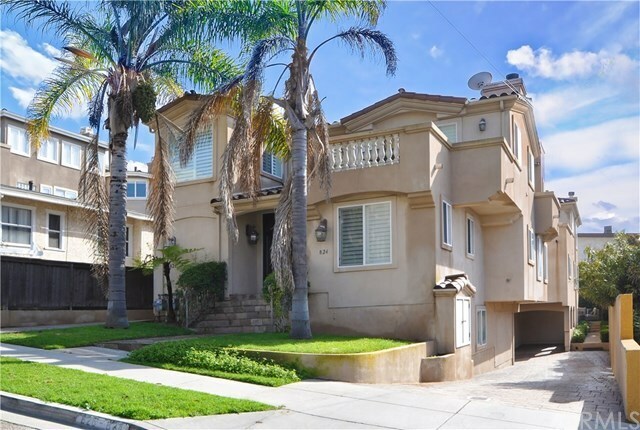 This home is ideally located within walking distance to the top-rated Hermosa Beach school district, moments away from trendy Pier Avenue and a quick jaunt to the Strand.